My kids are under the impression that they can be anything they want for Halloween, because I can make it happen for them. This is not necessarily true, but fortunately their requests have been ones that I can handle. 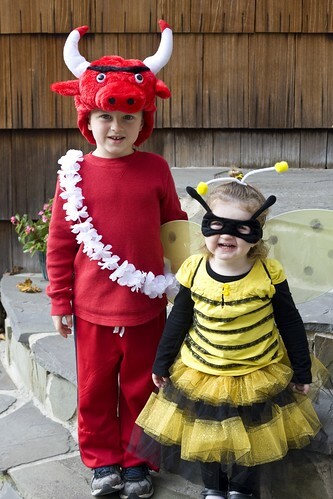 Last years’ joint costume was Ferdinand the bull and the bee who stung him. The Ferdinand costume was more “assembled” than “made”. The only thing I actually made was the tail, and that isn’t even in the picture. I did make the tutu for the bee and added the black lace stripes to the yellow shirt. 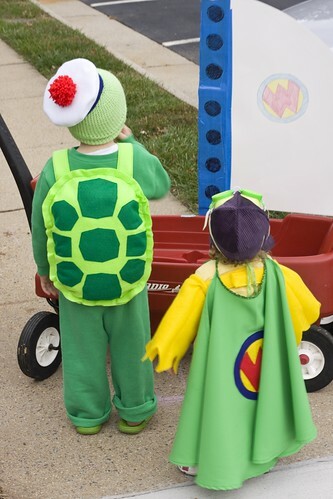 All in all, a very easy do-it-yourself costume. 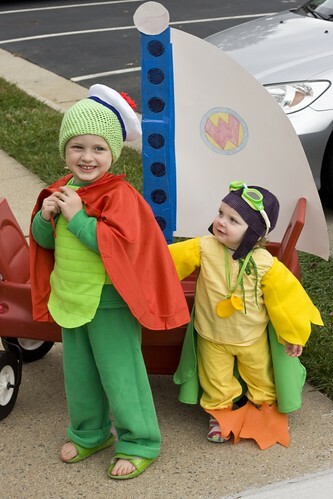 The year before that, they decided to be the Wonderpets (minus one pet). This was a more ambitious undertaking. Unfortunately, you can’t really see the awesome capes with the Wonderpets logo sewn on – I really should have taken a better picture of that! But you can see the homemade sail to the flyboat, hats, and various animal appendages. This is the costume undertaking that has led my kids to believe that I can make anything they dream up.